On his houseboat on the edge of Toulouse, quiet, careful Baptiste Molino helps his clients to be happy. For himself he maintains a calm existence and is content with his life, despite Sophie, the young waitress in his local bar, urging him to rediscover passion. But new client Amandine Rousseau is a puzzle he finds hard to unlock. Elegant, enigmatic – can he help her to find what she’s looking for without his own life capsizing? 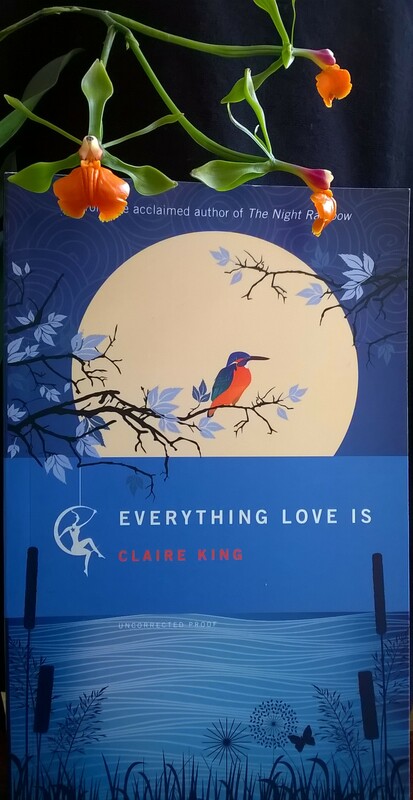 Claire King’s Everything Love Is is a beautiful thing. The cover art is glorious, David Mann’s design working not only to pick up motifs from the story but to weave into the image a sense of what’s between those lovely covers. Look at it again when you’ve finished and you’ll know what I mean! The story itself nestles into that quiet category. You might not think it from the opening chapter, which would stand as a short story in its own right, but this is a book that whispers in your ear. It’s gentle and persuasive and the further in you get the more it hugs you close. Take my advice and give yourself some good blocks of time – though the chapters are generally short you’ll appreciate it all the more taking time to devour it in large chunks. I don’t want to say too much about the story itself because that would be to give the game away – even getting into how good the characters are – but let me say that you’ll enjoy Amandine and Baptiste easily as much as you enjoyed Pea and Margot in The Night Rainbow, Claire’s debut novel. The title is perfect, though that’s a conclusion I come to having finished the book. As with her writing, the further into the story you get, the sharper and deeper the connotation becomes. There’s a quote I would love to have included at this point, but I fear to do so will rob the reader of a little of the magic that’s waiting to be found. Maybe I’ll come back and add it in a couple years when it’s a bestseller. It is a very moving story, and exquisitely structured. In another life I think Claire King might have made a good magician. As with The Night Rainbow, awareness of what’s really going on dawned on me in stages. There were suspicions and suppositions but when it comes to that point – when the structure clicks irrevocably into place – it’s a hand-to-the-heart moment. As to Claire’s sleight of pen, there is a moment on which the story turns that’s so innocuous I’d defy anyone to notice it first time around. It’s really nicely done. Summer’s not far away now. If you’re thinking about your holiday books make sure this one’s on your list. It’s a book to really settle into and take your time with. And it’ll haunt you after the last page, too. If that’s not a sure sign of a great book I don’t know what is. I won’t be surprised to find it haunting me still come the end of the year when I’m thinking about my 2016 favourites. My thanks to Myfanwy at Bloomsbury for allowing me to review this lovely book. Tags: "book review", "book reviews", "Books", "Claire King", "Everything Love Is", "reviews", "Van Demal"
I couldn’t agree more, Van. This is a truly beautiful and moving book that has gone straight into my best books ever list. I was in bits by the end! I’m now reading it to Mrs Van. I’m going to have to add a line to the review I think suggesting an immediate re-read as it’s even richer second time around. The layers you miss first time because you can’t know the whole story! Yes, I’m with you. I’ll be surprised if it’s not in my top 5 by the end of the year.